It was mid-February 2008 and I had just jumped a 1.35-metre course on my horse, Carlos de Noel, in competition at the Winter Equestrian Festival in Wellington, Fla.
For those unfamiliar with the sport of show jumping, 1.35 is a preliminary height. It’s quite far below the highest level of the sport, where we jump fences set at 1.60. But at that time, it was a pretty big deal for me and it was an even bigger deal because my trainer, Eric Lamaze, told me that it had gone well enough that I could move up a height division and jump 1.40 the next week. I was finally on my way up! The next day, I was schooling an inexperienced six-year-old mare through a line of small jumps called cavalettis (small fixed obstacles that measure approximately one metre high). I jumped her through the grid (a series of small jumps in a row) and she went through it a little funny and too fast, not giving herself the time to jump it in proper form. I decided to do it again to help teach her to slow down. I called out to my friend and co-worker, who was in the same arena, “Hey, watch her jump through this, she’s wanting to rush it.” And that’s the last thing I remember. I woke up briefly with my face in the sand and searing pain in my back. Then I was unconscious again. My next memory was waking up in the emergency room of the local hospital. I was strapped to a board, feeling a lot of pain in my back, head, and ribs. There was suddenly a flurry of activity and the ER staff was telling the people around me that they had received the results of the CT scan. I had a very serious burst fracture at my T-6 vertebrae and I needed to be rushed to the nearest trauma centre in West Palm Beach, Fla. Once there, I was treated by the medical staff and, after a few more tests, we had a decision to make. Due to the nature of the injury, there were a lot of loose floating particles of bone around my spinal cord. The doctors told me I was extremely lucky not to have been paralyzed. There was still some risk that those pieces could shift and cause permanent damage, but we had two options: I could either spend six months in traction or I could have surgery performed that would leave me with a plate, six screws, six clips, and two titanium rods inserted, and my spine fused from T-2 to T-10. My only question: which procedure would get me back in the saddle sooner? I chose the second option and, after an eight-hour surgery, I had a new, remastered spine. The pain that followed was fairly excruciating and I couldn’t move very much for a few weeks. Even after I was released from the hospital I couldn’t stay upright for more than a few hours at a time. But, as the saying goes, time heals all wounds. By August, I was able to travel to the 2008 Olympic Games to watch Canada win a team silver medal and Eric Lamaze claim the individual gold in the sport of show jumping. This was a pivotal moment for me. As I was sitting in the stands with my back brace on, screaming my head off with all the Canadian fans, I set a goal for myself: I wanted to ride at the next Olympics in London. My injury kept me off a horse for six months and out of the competition arena for one year. During that period, I spent a lot of time training with Andy Ziegler at Artisan Farms. We formed a great relationship and, over the next three years, I was able to rise through the ranks and to the top level of the sport, thanks to Andy and his wife, Carlene, who supported me with some incredible horses. I started riding an eight-year-old horse that the Zieglers purchased for me in 2010, and he took me to my first international victory. His name was Victor, and he was also the horse that took me to my first Olympic Games in London in 2012. 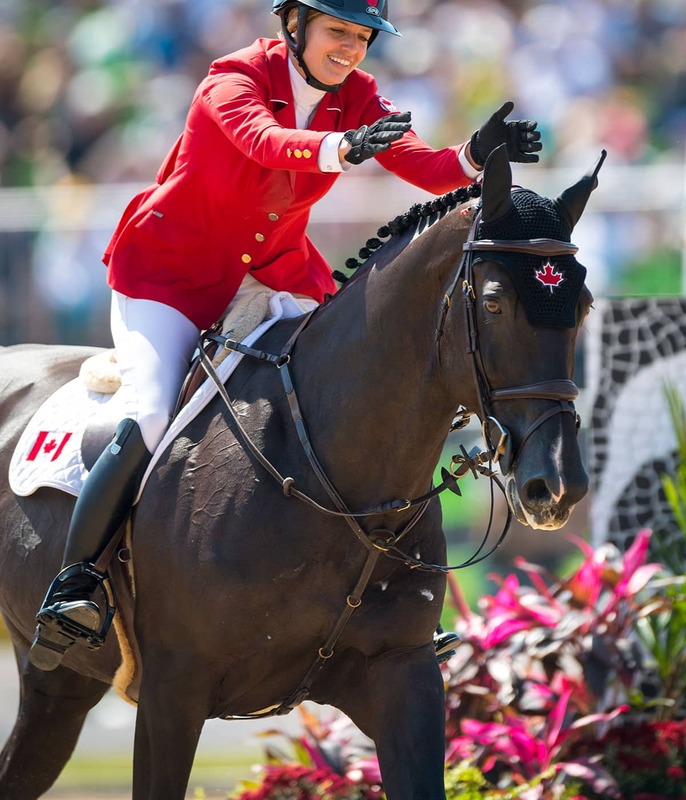 Since then, I have had the opportunity to ride at the best competitions in the world, and I have participated in every major championship that Canada has sent a team to, including winning a team gold medal at the 2015 Pan American Games in Toronto. The highlight of my career so far was my clear round riding Tripple X in the team final at the 2016 Rio Olympics. That ride put us into a jump-off for the bronze medal against the powerhouse German team. We missed out on a medal that time but, with the horses I have coming up the pipeline and the continued support from Artisan Farms, I have set a new goal — an Olympic medal in Tokyo!